Beautiful ginger bread house. You have a very talented fried. Happy WW! Great shots! Loved the gingerbread house and how she set it up. Have a great WW! very beautiful and a lot of hard work!! I made one one year and know how difficult that was. Nice job!! One of the best traditions of the season. Looks wonderful. Your friend is very talented! 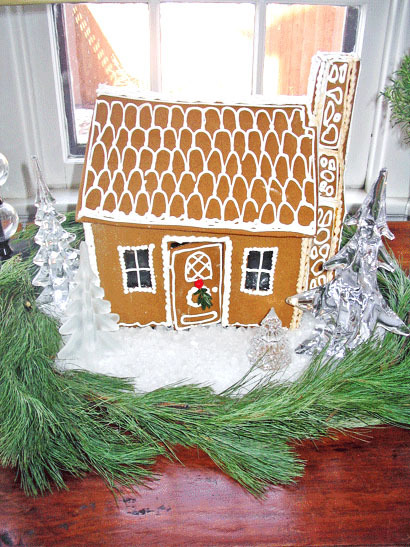 What a beautiful little gingerbread house! That is really wonderful! I would love to be able to do this, maybe I’ll try! I want a piece!! 🙂 Beautiful! So cute! We’ll have to give one a shot. WOW!!! what a lovely piece of art, keep it up!!! That is adorable!! Great shot and talent. Happy WW. Wow! Very nice! That took a lot of work! That’s very pretty and I love she set up on the table. Wow! You can tell a lot of work went into that! Reminds me of our little cabin. Oh and you have balls now! *giggle* I like them on your template. I really enjoyed decorating my site this year. Oh, it’s beautiful! Your friend really is gifted. What lovely work! I will once again attempt to make one of those this year. My last attempt resulted in gingerbread “bar.” Very embarrassing..so I just said it was a bar. That one is very pretty and I love how it’s arranged. 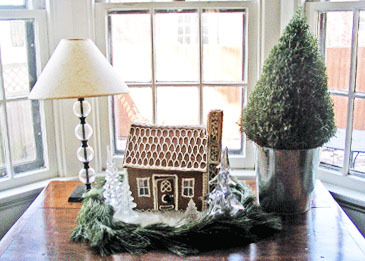 I shall have to show you the sorry gingerbread house (from a kit) that my kids and I will make soon. Your friend puts us to shame.